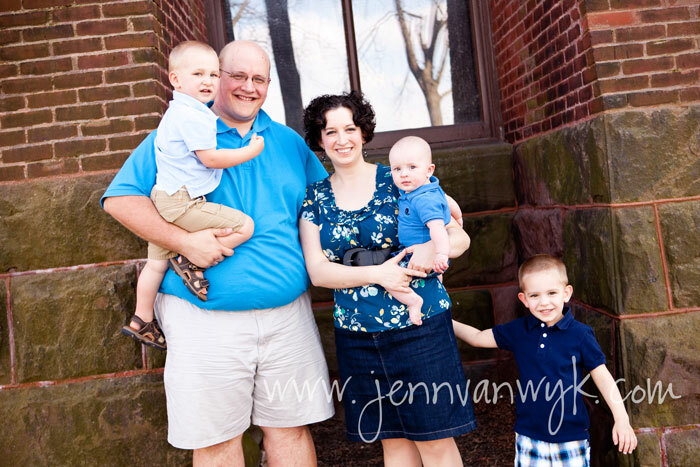 Last year we got some family photos taken by my college pal, Jenn Van Wyk. It was March 18, 2012 and it was just over 80 degrees. In Madison, Wisconsin. Right next to Lake Mendota. In March. Talk about Heaven on Earth! We actually had to stop at a shoe store on the drive to our shoot so we could buy sandals for the kids because clearly the socks and shoes we had originally planned on were not going to cut it with the shorts the boys were now wearing. It was absolutely amazing. In retrospect, I wish I would have put a little less thought into picking out our outfits for those photos. Yes, you read that correctly. Less thought. Anyone who has known me for longer than five minutes knows I am a compulsive planner who tends to over-analyze pretty much everything. I ended up choosing outfits for our photos that looked fine, but were a little too matchy-matchy. I picked out different shades of blue for everyone and also incorporated different patterns, but I wish I would have thought outside the box a little more. 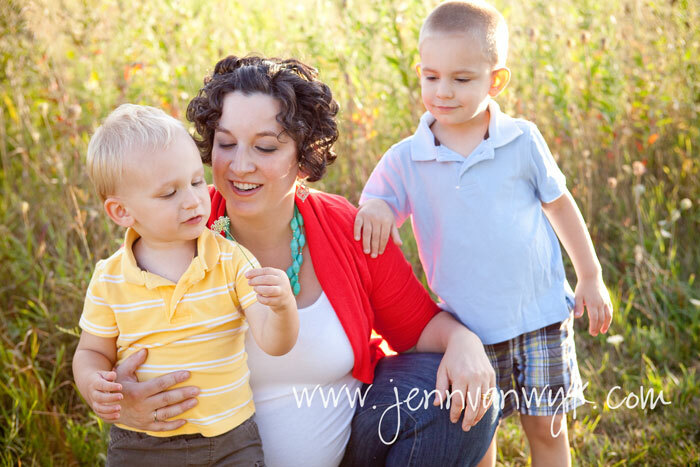 The previous year, Jenn shot some maternity photos for me and I had my two older boys in a few of the shots. Here, I took some more freedom with the color palate of our clothes and I really loved the results. Yellow, orange, brown, teal, and blue all make an appearance here, but the result was still cohesive and carefree. So here I sit a few days out from our family photos for the year of 2013 and I still haven't picked out what we should wear. I reached out to Jenn and she not only responded, but did me one better - A guest blog post!! I'm going to turn the rest of this post over to Jenn and let her school us on how to prepare the outfits for your family photo shoot. What do I wear to our photo session? Dun, dun dunnnnn. This question has always caught me off guard. I dig through my closet for way longer than I should in the morning, buy things on super clearance, don’t have any subscriptions to fashion magazines, and I’m lucky if I can dig out a pair of matching earrings. My friends and I have talked about submitting each other for “What Not To Wear” just so we could start over from scratch and get some fashion advice. Plus who wouldn’t want to meet Stacy and Clinton? But as I continue to grow as a photographer and I get asked this question again and again, I see the need for a little shift in how we think of dressing for family and engagement photography. First off. It is not 1990 anymore. It is out of date to wear white shirts with blue jeans to your family session. Or any other kind of matching shirt with matching pants. It looks dorky. Trust me, I know. I am a dork myself. Dressing your family, or significant other like this creates is a flat, boring photo. Everyone looks the same. Plus, you might end up on AwkwardFamilyPhotos.com, and I want to spare you and I the hassle. So, what is one to do? Forget matchy matchy. Instead, think coordinate. Pick colors that go well together. Think of it this way. If you decided to paint the walls in your living room red, you wouldn’t buy all red furniture, accessories, and coffee tables. You would buy accessories that coordinated. Dark woods, browns, oranges, and you might even get a little adventurous and throw in some pink. You get the picture. Do the same when choosing your outfits for your photo session. This will help build depth, character, and give your photos a little personality. Since I am a visual learner, I am going to go “shopping” online and put together some affordable (I chose to “shop” exclusively at Old Navy) and cute outfits for all sorts of different photo shoots. First up, an engagement session. Right away I am breaking the “matchy matchy” rule! I decided on a warm color palette because I really liked the bold citrus colors of this sun dress. Since I wanted to keep our color scheme warm, I added in the brown shirt for our lucky groom-to-be. Add in a few cute accessories and wa-la! I chose a cardigan for the bride-to-be to add a little variation to her outfit. She can wear it buttoned or opened, have it on or off, or it would be cute off slug with one hand sassy over her shoulder. Plus, an open cardigan over a form fitting bottom piece can make the bride-to-be appear slimmer. Another thing I like about this combination is the variation in textures of the clothing. The dress is a nice soft linen, the cardigan a fine gauge sweater. The guy’s shirt is smooth cotton, combined with the rugged dark jeans. All of this creates visual interest in the photo. These bright colors are fun and flirty, and would be great for a summer or fall engagement session. I again decided to go with a theme of warm colors. I started off with this cute top for mom in pink, and found a yellow shirt for dad. I opened up the color palette to some browns for the little guy, and found this cute little summery shirt. And good grief, I can not resist those adorable sun dresses for the little girls! So I chose this one in pink and white. I also liked the texture of the dress which will also create visual interest. Again, notice that everyone’s outfits coordinate and are not “matchy matchy”. Mom will look great with daughter, son with father, son and daughter, mom and dad, and so on and so forth. Have fun, use bold colors! These will pop in all of the photos and add some visual interest. I also threw in the hat for the little boy. Don’t be afraid to add some fun accessories to your outfits. Hats, scarfs, and even props like wagons and toys work great and will add a touch of personalization to your session. Now as for the Arena Five family, we are headed to the Wisconsin State Capitol in spring time with the tulips in full bloom. Incorporating the tips above, I would also suggest coordinating your clothing with the red and yellow color of the tulips. Not match the colors per say, but make sure that what you are wearing will not clash with them. The Capitol also is neutral backdrop with little texture or interest, so I would wear clothes with a variety of textures and colors to standout. I would avoid wearing white, creme or grey tops with little texture or visual interest. As for the boys, spring for a few things that would be outside of the "everyday"; think about cute hats and perhaps a casual tie for those little guys who are willing to wear them. The Capitol also has a great lawn, so bring along a blanket (or borrow one of mine!) with a coordinating color and great texture. This will allow us lots of space to let your little buggers run around and be boys. I love capturing brothers and families for that matter outside of the traditional posed photography. This gives you the most genuine and authentic smiles of them all! I hope this helps in planning your photo session, and I would love to hear your tips and tricks for coordinating your family's clothing for a photo shoot! Have questions for Jenn? Feel free to leave a comment here or email her at jenn@jennvanwyk.com! What I Wore Wednesday - Pop o' Red! WIWW - Stitch Fix Review #3 and GIVEAWAY!! This Post Totally Made Sense in my Head.